While it is almost impossible to stop Chinese firms from winning contracts with low bids, Vietnamese developers need to ensure that contractors will do the work properly, a local expert said. Chinese contractors are known for undercutting competition with low bids to win tenders offered by Vietnamese developers for construction projects, only to carry out them with either tardy progress or huge cost overruns. Despite quality issues, Le Van Thinh, former head of quality assurance of construction projects under the Ministry of Construction, believes it is nearly impossible to make a change. 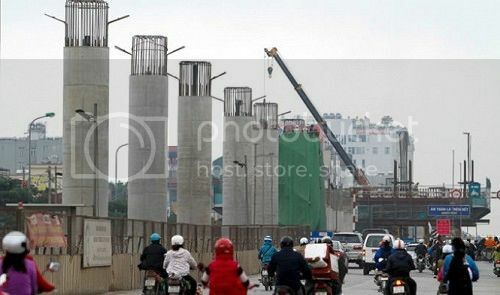 “Vietnam is a member of the World Trade Organisation and it is impossible to discriminate against Chinese contractors when inviting bids for a contract,” Thinh told Tuoi Tre (Youth) newspaper. A possible solution is to use technical barriers, or set standards that Chinese companies may fail to meet, according to the expert. “However, Chinese contractors can now meet all technical specifications for almost all types of equipment,” he added. “Their tender applications tend to be so well prepared that they cannot be rejected so there is probably no chance to eliminate Chinese contractors in the first place. Thinh also said Vietnamese developers should be careful in negotiating contracts with Chinese firms, as most Chinese-contracted constructions have proven tardy, unsafe, and of poor-quality. The expert added that the Vietnamese side usually has “limited ability” in negotiating the contracts, and often must agree to loose requirements or vague clauses. “The contract terms and conditions are very important ‘weapons’,” he observed. Thinh spoke to Tuoi Tre after Viwasupco, a Hanoi-based water company, raised widespread concern by awarding a multimillion pipe supplying contract for a crucial project to a Chinese contractor. Beijing-based Xinxing Co. Ltd won the bid to supply ductile iron pipes to the 21-km pipeline of the Song Da Song Da Water Project – Phase II under a VND588 billion (US$26.25 million) contract. The Chinese firm beat a French and another Chinese bidder by offering a price nearly 12 percent lower than the asking price. The Song Da project transmits clean water from the Da River Water Plant in the northern province of Hoa Binh to Hanoi. The quality of the pipes, in terms of durability and chemical safety, is consequently crucial to citizens of the Vietnamese capital. As it is too late to cry over spilled milk, Thinh recommended that the developer carefully prepare the final contract it is to sign with the Chinese supplier. “It is a real problem to be able to prepare a [good] contract,” Thinh said. Thinh also advised that the developer hire an international agency to supervise the contract implementation. Viwasupco said earlier this week that it has yet to sign the contract, previously slated by the end of this month, apparently under pressure following the quality concern.